If the photos we’re receiving are any indication, neighborhoods across Alabama (and as far away as Pennsylvania) will soon be set upon by roving hordes of Gus Malzahns, extorting candy from Auburn fans, terrifying Alabama fans. 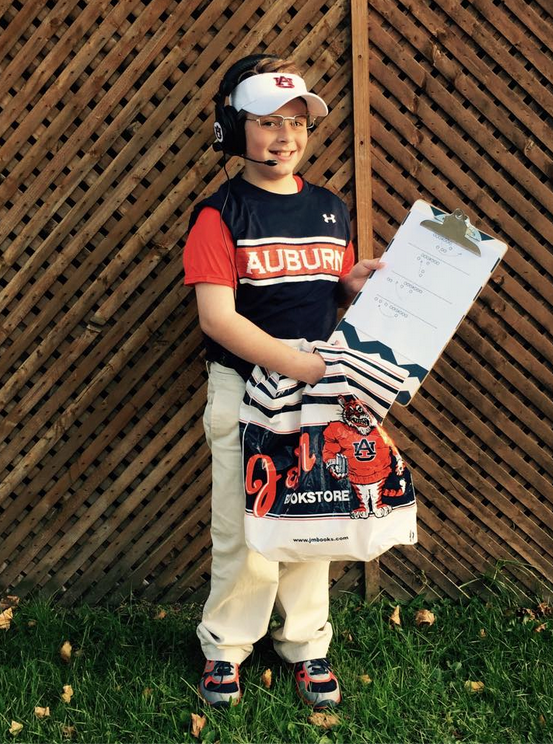 Yes, trick-or-treat tributes to the New Ball Coach appear to be all the rage among Auburn fans this Halloween. But what does one need to truly pull off the perfect Gustume? To find out, we asked two (of the three) people who know him better than anyone: His lovely wife Kristi and hilarious daughter Kenzie. There you have it—the recipe for a perfect LAST SECOND costume. If there’s gum in his mouth, this kid pretty much nailed it. Oh, and those staying home Friday night can join the fun by stocking up on Gus’ favorite candy. “He loves Milk Duds, Reeses, and PayDays!” Kenzie says. Related: Bama fan trick or treaters forced to relive worst nightmare at church Halloween event in Birmingham.